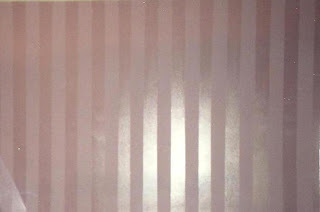 Painted stripes using a flat and a satin finish create an elegant look for a dining room or a focal area. The satin sheen stripes capture the light and reflect a beautiful soft glow. For those of us who have 8 ft. ceilings this is a great way to create an illusion of height to the room. Prep your area first, cover floors, remove pictures, move furniture, repair walls if necessary. Apply two coats of flat latex paint in the color of your choice. Use a good quality paint. Once the paint is fully dried measure out the stripes, in this case they were 4 in. wide. I use a 4 ft. level to lightly pencil in lines for the tape. Tape off your lines on both sides of the each stripe. Every other stripe will be taped. Use a low tack tape so the paint does not get pulled off the wall when removing. Use a 1 1/2 in. wide tape. When the taping is completed apply a clear satin urethane to all the bare stripes using a brush to cut in top and bottom and then a small roller. The roller cover should be lint free and a 1/4 in. nap. Apply a small even amount to the roller and gently roll on the wall, a second coat may be required. Remove excess urethane so it does not drip all over when rolling. Let this finish completely dry and then remove your tape being very careful not pull up your work. This is a great weekend project which may require two people with a supply of patience. Measuring and taping use up most of the time, the painting goes rather quick. Have fun! Lets face it we all make a mistake at one time or another but it would be great if we caught them as we were doing it. Here are a few examples of over-sites which could be avoided. In this photo too much paint was applied either by roller or brush. Applying to much pressure to the roller would also cause this. To correct this if its still wet is to blend in the paint with a brush or roller. If it dried then carefully sanding with 220 grit should work. 150 grit if you need to be more aggressive. In some cases the sanding may lift the area and spackle may be used to smooth out the damage. Again, too much paint on the brush. Catch this when wet and it should not be a problem. Use a drier brush and lift the excess out then blend. When painting wood apply the paint either by brush or roller in the direction of the wood grain. Don't be tempted to cover the area in one coat. On cabinets thin coats will produce a beautiful finish. These ropes will appear when the pressure on the roller is uneven. Roll over if wet and blend in. If dry, sand lightly and skim coat with spackle to cover. Note: Latex paint does not sand well, so avoid these paint ropes. Oil base sands well but try to avoid the extra work. Important: When sanding lead dust may enter the air which causes many health problems. Check first for lead before starting your project. Read all product labels.